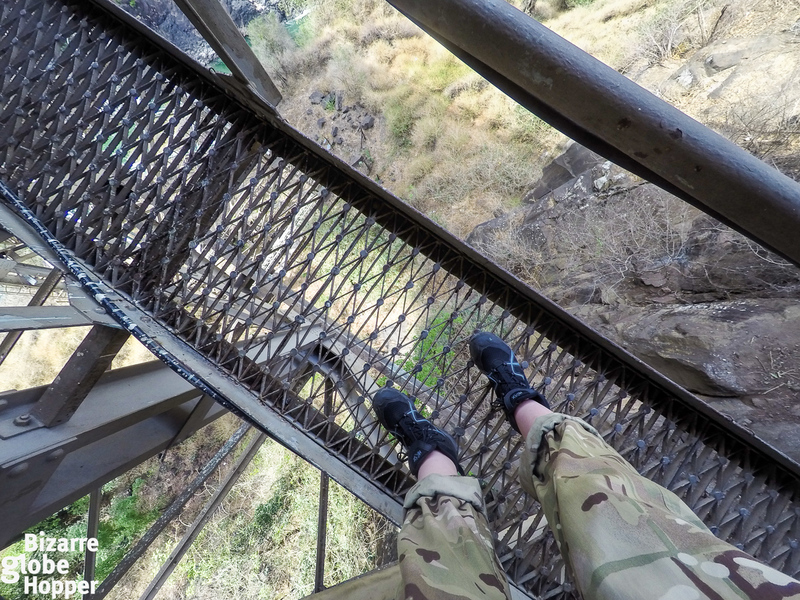 I’m standing on the Victoria Falls Bridge in a tight bungee harness, paralyzed from the fear, my hands spread out wide and feet already over the edge. I’m afraid of heights: every time I look down from any bridge, I start to sway and picture myself falling down. Now I’ve made my last walk with feet bonded tightly together to the edge of this massive bridge, and there’s no another way out besides the freefall. Two men are standing behind me, and if I’m not jumping, they will push me down towards the raging rapids of Zambezi River, 110 meters below my feet. When the men start counting, I know that the end is near. Time lingers by slowly. “Five!” I breathe as deep as I can. “Four!” Is this it, am I going to die? “Three!” Gather yourself, keep your eyes on the horizon, don’t look down, or you lose yourself to the fear. “Two!” Concentrate! You can do this! Just remember to dive out as far as you can, so you’ll be safe, they said. “Bungee!” I concentrate my mind on the movement, jumping as far as I can, and free-fall headfirst towards the crocodile-infested Zambezi. The jumping phase felt rather manageable. I was so concerned with executing the bungee jump correctly that there was no room for fear in my mind. The crew had pointed out very clearly that a long jump prevents injuries, so I practiced the perfect leap in my mind and put all my cells in work to produce the life-saving bungee jump. Counting helped me to gather my strength in time. I usually count when feeling terrified, just to balance the emotions and feed the mind with routine instead of the destructive cycle of fearful thoughts. Counting reminds me of my meditation practice, instantly calming body’s stress reactions. However, the free-fall felt awful again, probably because I had no means of controlling the situation anymore. I still wasn’t sure if I was going to make it. I felt the rush of the bungee, but couldn’t enjoy it. During a couple of seconds, I tried to take deep breaths, but the raging thoughts took over again. In a flash, I remembered the bungee accident from 2012, when the cord broke off here at the Victoria Falls Bridge. The bungee jumper crashed into the river; feet still hung together. Somehow that person managed to unfold the tangled bungee cord from the bottom of the river and swim to the shore avoiding crocodiles. I knew I couldn’t do the same. Suddenly my bungee cord bounced forcefully, whisking me to the standing position, then upside-down again. I freaked up again, thinking that something should have gone wrong because the river seemed to be far away from my bounces. Deep breathing brought me back to the moment and accidentally I enjoyed the scenery. 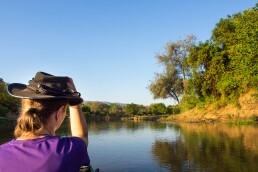 The mighty Zambezi was shimmering below my face, and I could see the exact rapid, where we had started our white water rafting trip the day before. It was surreal: I was hanging above the beautiful Zambezi Gorge that marks the border between Zambia and Zimbabwe, swinging from one country to another. When the bouncing got softer, I realized that I had survived the bungee, grinning widely. Conquering my fears felt overwhelming, though I wasn’t sure if I had enjoyed the bungee itself. The Victoria Falls Bridge bungee changed something in me forever. Immediately after the bungee, I wasn’t that much terrified of heights anymore. Even after the adrenaline rush had faded, my mindset towards the heights was veered. I don’t imagine myself falling down while walking at the edge of the bridges, nor do I fear to stand on the edge anymore. I know that I could do bungee again though it might still not be enjoyable. 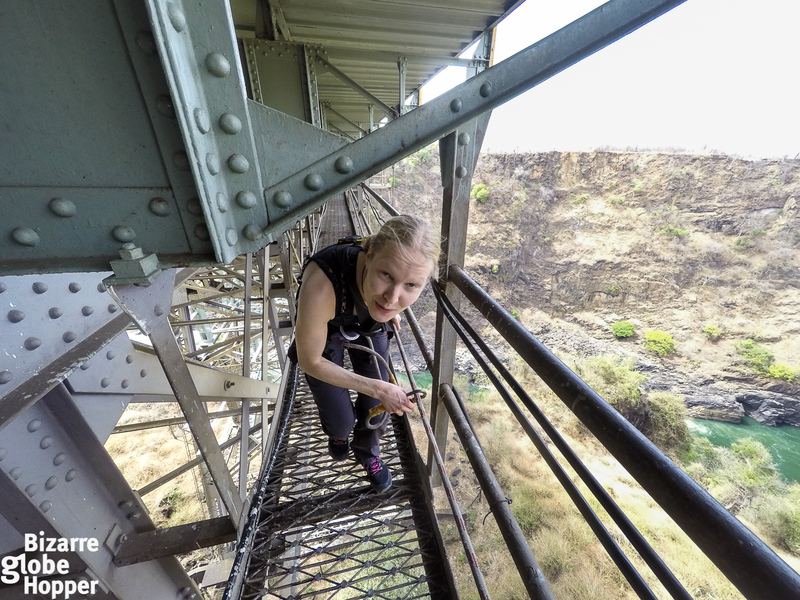 I was surprised how I reveled walking in the structures of the Victoria Falls Bridge right after the jump. You can do that also on a separate “Historic Victoria Falls Bridge Tour” if you’re not into bungee. Those catwalks under the bridge were used in the construction back in 1904, so it’s a journey through hundred years to the era of Victorian engineering. You can really feel – and smell – the history of this great railway bridge while walking beneath it. 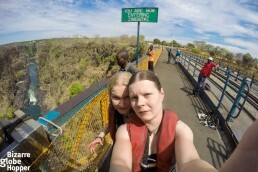 Is Victoria Falls Bridge Bungee Safe? The last recorded bungee accident happened in 2012. The possibility of accidents is said to be one in every 50 000 bungee jumps. I felt safe all the time since the crew was very firm and attentive. They checked our harnesses and locks many times before the bungee, gorge swing, and slide. The crew also did an excellent job in leading everyone towards the bungee, without letting us give up. They chatted with us all the time keeping our minds busy, thus avoiding second thoughts. Adrenaline junkies usually acknowledge the risks. In bungee, you might get leg injuries due to the bounces or for example hand injuries due to the wrong position. The usual restrictions apply: if you have health issues, such as heart problems, high blood pressure or back issues, you probably shouldn’t dream about the bungee. We both have back problems and were fine with the jump though the bounces gave us a mild pain. If you worry about accidents like me, it might soothe your mind to do a bungee above water. Though during the dry season, there won’t be enough water for a dive. Luckily the 2012 bungee accident happened during the rainy season, and it had poured just a day before. 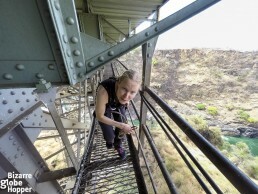 How to Prepare for the Victoria Falls Bridge Bungee? If you are afraid of heights, don’t start with the bungee at Victoria Falls Bridge. We took the “Big Air Experience” package, which included Gorge Slide, Gorge Swing and the Victoria Falls Bridge Bungee. Execute the lamest activity first to familiarize yourself with the heights. Gorge Slide is a zipline that takes you across the Zambezi Gorge from Zambia to Zimbabwe. The speed is only 25 km/h, so you have also time to enjoy the view. Sliding wasn’t scary to me since we’ve been zip-lining before. As a bonus, you’ll also get the Gorge Swing, which is both thrilling and hilarious, but not at all terrifying after the bungee. We shared the fun and did it as a tandem jump, screaming and laughing like crazies. In the Gorge Swing, the free fall phase felt slower than in bungee since you just take a long step from the platform instead of jumping. That’s why the falling phase also felt more enjoyable and drastic. After the fall, you’re just swinging above the Zambezi Gorge in a sitting position with a plenty of time to admire the view. Gorge Swing was my absolute favorite. Forget flip-flops and sandals unless you feel like bungee jumping barefoot. For most people, it is more comfortable to walk on the edge of the bridge with shoes on, since it won’t feel slippery. Listen to the instructions carefully and picture yourself leaping as far as you possibly can. It helped me to make a proper bungee jump, although my mind was raging at the exact moment. Remember to breathe, as it will soothe your system. Trust that everything will go right and enjoy the scenery! 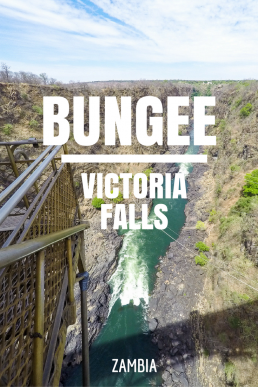 The Victoria Falls Bungee is constantly voted among the best bungees in the world. 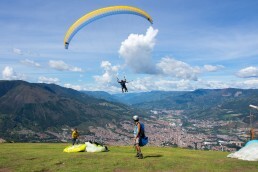 Where else can you admire the World Heritage Site during your bungee jump while swinging from one country to another? Are you afraid of heights like me? 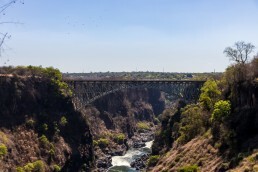 Have you done a bungee or would you dare to jump off the Victoria Falls Bridge? We would love to hear about your bungee experiences! 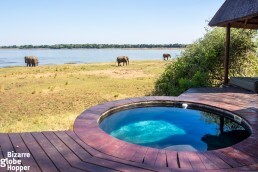 Our journey through Zambia was hosted by Zambian Traveller. Shearwater Victoria Falls gave us a discount on their Big Air Experience Package including Gorge Swing, Gorge Slide, and The Victoria Falls Bridge Bungee. Thanks for your support, ladies! It’s actually easier than you would have thought. Freezing isn’t possible because those guys will push you over the edge – both mentally and physically. But I’m still not sure, if I could go skydiving – that’s a lot higher! 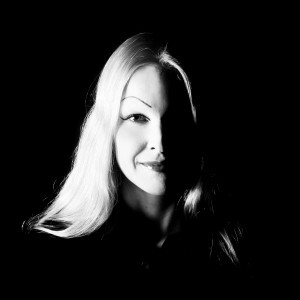 Oh my, I am terrified just looking at these photos! Good for you though for facing a fear and going for it. So empowering! While reading your article I felt like I am taking this huge plunge! Wow! Amazing! I loved this post! I would love to do a bungee, but I know I’m too afraid to jump myself, I imagine I’d just freeze when it came to it. I did a skydive and loved it, but you’re attached to someone who makes the jump so you don’t have to do it yourself. I can imagine it must change how you feel about heights. I hope I do get to do one someday, thanks for sharing your experience!